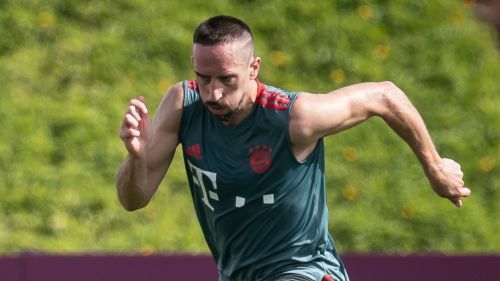 Franck Ribery is back in team training with Bayern Munich after recovering from a hamstring injury, the Bundesliga giants confirmed on Wednesday. Ribery was hurt in a Doha training camp this month and has not been able to feature for Bayern since the Bundesliga returned from a mid-season break. But the former France winger could be available for Bayern's next game, which is away to Bayer Leverkusen on Saturday, although a DFB-Pokal tie at Hertha Berlin four days later may be a more realistic target. Ribery has been restricted to nine Bundesliga starts so far this season, scoring four league goals, but his return to action will be a boost for Niko Kovac's side over the second half of the campaign. The 35-year-old's contract expires at the end of the season and he is expected to follow fellow veteran winger Arjen Robben out of the club, with Bayern targeting Chelsea's Callum Hudson-Odoi as a replacement. Bayern have won seven games in a row in the league but remain six points behind league leaders Borussia Dortmund as the champions hunt a seventh successive title.